A new bill introduced today in the Senate provides necessary protections from NSA surveillance programs. The USA Rights Act, introduced by Senators Ron Wyden (D-Ore.), Rand Paul (R-Ky.), and eleven other Senators would provide meaningful reforms to one of the government’s most powerful surveillance tools. It fixes the “backdoor search loophole,” which now allows warrantless searches of the NSA-collected contents of Americans’ communications. It extends broad oversight powers to an independent agency. It guarantees the end of a controversial type of data search (called “about” searches) that the NSA suspended earlier this year. It improves judicial oversight of the government’s surveillance regime. It provides better transparency and requires stricter reporting. Representatives Zoe Lofgren (D-Cal.) and Ted Poe (R-Tex.) also introduced companion legislation today in the House of Representatives. EFF supports the USA Rights Act, and we urge Congress to enact it. Plainly, the introduced legislation is a lighthouse—a beacon that extends new light on the government’s opaque surveillance regime, hopefully guiding future legislation on similar issues. At the heart of the USA Rights Act is the reform of Section 702 of the FISA Amendments Act of 2008, a law set to expire at the end of this year. Section 702 allows the NSA to collect the communications of foreign individuals not living in the United States. These collections are done ostensibly in the name of foreign intelligence and national security. But Section 702 also sweeps up a vast number of communications of countless Americans. Those communications are then stored in a database that can be searched by the NSA and other intelligence agencies, including the FBI, without obtaining a warrant. Those are called “backdoor” searches, because they evade ordinary Fourth Amendment protection of the privacy of Americans’ communications. EFF is fighting in court to prove that this entire system of NSA surveillance is unconstitutional. The USA Rights Act closes the backdoor search loophole. Government agents searching Section 702-collected data for information on a U.S. person, or a person inside the U.S., would need to acquire a warrant first. The bill’s warrant exception for “emergency situations” would require subsequent judicial oversight. EFF welcomes this immediate and plain-language change to how government agents access Americans’ communications. The USA Rights Act also guarantees the end of “about” searches. Under this practice, the NSA collected—and the NSA and other government agencies searched—communications that were “about” a targeted individual, but not “to” or “from” them. This practice swept up the communications of many people who were not targets of NSA surveillance. Though the NSA earlier this year announced the suspension of “about” collection, the NSA might reverse course. The USA Rights Act ensures the NSA cannot reinstitute this practice. This is a reassuring move. 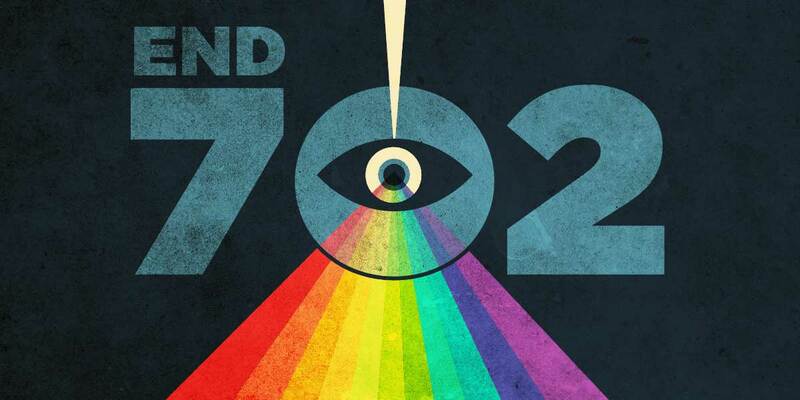 The bill also bolsters the mechanisms for Section 702 oversight. Currently, Section 702 is subject to insufficient government oversight. For example, intelligence officials have gotten away with stonewalling questions from Congress, and evading queries from the court that approves warrants under Section 702—the Foreign Intelligence Surveillance Court (FISC). To address this problem, the bill would improve judicial oversight of Section 702. First, it would make it easier for individuals to bring constitutional lawsuits challenging the program by addressing a legal doctrine called “standing.” Second, it would ensure that criminal defendants are notified when the government uses Section 702-derived data as evidence against them. The bill also would expand the opportunities for the FISC’s official amicus curiae to participate in FISC proceedings. In 2015, Congress established this amicus as a way to ensure that the FISC did not make Section 702 decisions based solely on the views of the government. Also, the bill extends new powers and authority to the Privacy and Civil Liberties Oversight Board, an independent agency established by Congress. Under the bill, the Board will be able to receive and investigate all whistleblower complaints made through approved government channels. The Board will gain the independent power to subpoena individuals, removing the current requirement that the Attorney General approve such requests. The Board’s non-chair members will become salaried employees. And the Board receives an expanded mandate to review all foreign intelligence activities. These are just some of the specific improvements written in the USA Rights Act. Overall, the bill provides better reporting, transparency, protections, and oversight. It also prohibits the collection of purely domestic communications, and creates new checks and balances in the appointment of judges to the FISC and the FISA Court of Review. Finally, the authors of the USA Rights Act understand that surveillance oversight must be an ongoing discussion. The USA Rights Act thus calls for a four-year sunset. The USA Rights Act provides meaningful reform to Section 702 and would advance the civil liberties guaranteed by the Constitution. We welcome and support this bill.